You’ll find toasted breads, bagels, and other bakery items in a wide range of restaurants from small cafes to full-service breakfast buffets. Fortunately, there are many different sizes, styles, and setups of commercial toasting equipment that can suit every scenario, if you simply know how to wade through the options. Consider these toasters to be the commercial version of an at-home toaster and typically a lot faster. They operate by lowering slices into a heating chamber via a lever, and the products are toasted via heating element. Because they have the smallest output of commercial toasters, they’re typically reserved for smaller coffee shops and the like. On the plus side, they take up less space, which can be critical to these smaller establishments. Best for: English muffins and some models can accommodate bagels halves and Texas toast. Utility Req’s:Most require a 120v electrical hookup while some heavy duty models need a 208/240v connection. Slot Size:The size of the slots will determine the thickest type of products you can fit into the cavity. Thus, if you’re planning on using this toaster for bagel halves or Texas toast, for instance, then pay close attention to the opening size for your toaster. Slots:Most commercial pop-up toasters will come in 2-4 slots. Temperature:While these toasters typically cannot be adjusted in terms of heating temperature, keep in mind that some models only have heating elements on one side. Timer:A timer like your household toaster measures the amount of time that the product stays in the heating cavity, with more time corresponding to darker toasting results. Light Duty:These are suited for the smallest-volume operations and typically produce 80 slices or less in an hour. Standard Duty:These toast anywhere between 80-150 slices in an hour. Heavy Duty:150-500 slices can be toasted in an hour, making this ideal for setups that don’t quite need a conveyor toaster but see a fair amount of toasting in a day. Compared to a pop-up toaster, conveyor toasters are built for higher volume outputs and wider ranges of bread sizes and types. Users load bread into a feed area at the front of the unit wherein the product is drawn back on a conveyor towards heating elements, toasted, and unloaded at a collection area at the bottom. NOTE! 120v. units of the same model will produce significantly less toast per hour than 208v. Opening: the feed tray can range in size from 1.5” to 3”, so make sure that the products you plan to toast will fit within the specified opening size for your toaster. Heating elements: metal will last longer but will take longer to heat up. Glass elements heat up almost instantly but are more fragile. Toaster speed: it becomes physically impossible for one person to load 1600 slices per hr. but it can toast a slice of bread in 30 seconds. Note that manufacturer claims are based on perfect conditions. You will likely see around 20% less. Controls: depending on the model/manufacturer, some top and bottom heating elements can be turned off, and some allow for toasting on one side at a time. Timer / sensors: conveyor speed is what determines the amount of time that a product is exposed to heating elements within the toaster. Some units come with sensors that vary the speed so that you get toast at the right color. Stacking Kit: if you’re investing in multiple conveyor toasters but want to save on space, purchase a stacking kit to stack your toasters without increasing your footprint. Wall Mount Kit: some manufacturers allow for wall-mounting capabilities to help kitchens conserve counter space. In lieu of heating elements, a bun grilling toaster utilizes griddle plates. This allows for the user to toast items dry or with butter for caramelizing bread for a richer product. 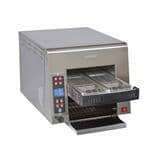 In the same fashion as a conveyor toaster, a bun grilling toaster has a vertical feed, conveyor, and exit chute. If you’re looking for buttered, toasted bun products, then opt for a bun grilling toaster over a conveyor oven. Dry vs Wet: Teflon sheets are required when toasting items dry (these are typically included with the unit, and replacement sheets are available). Otherwise, use a roller mechanism to apply butter before toasting for a wet toast. Opening: Self-adjusting conveyor systems allow for a range of different-sized items. Temperature: A thermostatic control can be adjusted for heat variations. Timer: Gear settings determine the amount of time a product is in the toaster while griddle settings can be adjusted simultaneously for different textures and toastiness. Commercial toasters can be in constant use (for instance, in a bakery or sandwich shop) or may be used only sparingly, but the general cleaning methods are the same. Always power your toaster to off and unplug it before cleaning (for safety reasons). Pull out the crumb drawer and consider using foil as a liner to prevent having debris buildup directly on the pan. Dislodge crumbs from the toaster coils, and use soapy water and a scrub brush for any wire racks. You can also use a commercial degreaser sprayed on your rag (not on the toaster directly) to clean the walls of the inside cavity. Don’t forget to wipe the outside of the toaster walls as well for a clean appearance! Some toasters are easier to take apart for cleaning and to dislodge a stuck item.